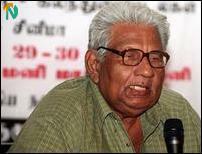 “There is an unfortunate stereotyping of Tamils in the minds of the Singhalese and vice versa. This literary/cultural festival will enable artistes from both sides to discover developments over the last twenty years. This would foster an understanding where it matters”, said Prof. Sucharitha Gamlath, a distinguished and leading Sinhala scholar, addressing a press conference in downtown Colombo Monday on the Tamil/Sinhala cultural festival to be held in Sri Lanka’s capital this week. “The main task of this festival is to bring together Sinhala and Tamil artistes and intellectuals. There is a lot of commonness among the workers and peasants on both sides. They share the same aspirations too”, Prof. Gamlath said. Prof. K. Sivathamby, the eminent Tamil scholar, Mr. Dharmasiri Bandaranayaka, the well-regarded Sinhala film director and Prof. Gamlath addressed the press briefing on the Tamil/Sinhala literary festival Monday at the Nippon Hotel in Colombo. ‘Divaina’, the Sinhala extremist paper, carried banner headlines Monday charging that the festival is the work of the Liberation Tigers. It accused the panel of Sinhala scholars, film directors, poets, writers and artistes of being agents of the LTTE, claiming that they were also on the editorial board of the ‘Dedunna’, the Sinhala paper published by the Tigers from the Vanni. Sihala Urumaya, the Sinhala nationalist group, demanded that Colombo should arrest all those Tamils from the northern part of the island who take part in this festival. Meanwhile, the EPDP, paramilitary group closely aligned to President Chandrika Kumaratunga said that the festival should not be allowed in Colombo. Responding to a question relating to Monday’s Divaina lead story, Prof. Sivathamby pointed out that this kind of Sinhala agitation to impede and mar efforts to settle the ethnic problem in Sri Lanka has been the pattern since 1959. 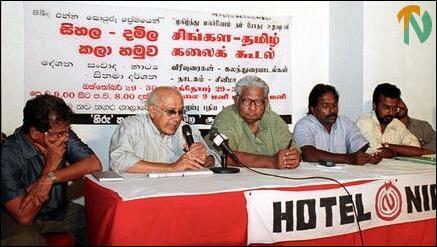 “I have a right to demand peace, regardless of what the Sinhala extremists say against it”, Prof. Sivathamby said. In his response to questions from journalists, Mr. Dharmasiri Bandaranayaka said that the Singhalese have become an insecure society and that people tend to react in unpredictable ways in such a context. He drew attention to instances of violence in Sinhala society, which makes persons behave in this manner. “When genuine efforts are made by artistes with genuine social motivation they are criticised (by Singhalese). We have to get out of this mindset consciously”, the film director said. “When there are efforts to mobilize Sinhala opinion against peace, it is the duty of like minded Sinhala and Tamil artistes and intellectuals to rediscover their common bonds. Reminding ourselves of the work of Prof. D. E Hettiaratchi and Prof. Kamapathipillai we should rediscover our artistic heritage. This will provide a suitable environment for peace to fructify”, Prof. Sivathamby said.